This is a business book, not a policy book. 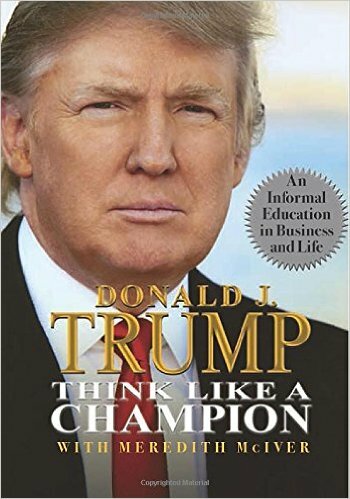 Trump has written several other business books too -- this is just the most recent one before he announced for the presidency, so people might read this one with more interest. The point that political readers should get is this: it is a normal, boring, plain ol' business book -- not flamboyant and not loud -- political readers should see THAT side of Trump too! These are not controversial, not new ideas, and not unique to the selections above -- they permeate the entire book, implying that they permeate Trump's thinking about how to succeed at business. In other words, Trump trusts the establishment viewpoint on how to succeed, and embodies that established viewpoint by applying them to his own business decisions. Politically, that implies he is NOT an anti-establishment iconoclastic "new ideas" kind of politician, although the mainstream media portrays him that way! Trump does sometimes have new business ideas, and he writes about them in this book. For example, his signature project (and his personal home), Trump Tower in New York City, is a "mixed use" project: it includes both hotel rooms and residences. Trump claims he invented that idea, and spread it around the world at his other big projects. However, his new ideas are the exception -- generally he follows the establishment way, asserts the old chestnuts, and spends page after page advocating that readers should follow the establishment way and respect the old chestnuts. Politically, that implies that when Trump has a new idea, he researches it well and then spends a lot of time perfecting it. That last article is a complaint about Trump's campaign not offering policy proposals beyond brief outlines. That's our biggest complaint about the mainstream media: they pretend that they have to report about his hair or other candidates' attacks. We at OnTheIssues are clear that the mainstream media CHOOSE to report primarily about Trump's hair and candidate attacks -- they PRETEND that Trump has no issue stances, because they don't want to undertake the hard work of reporting Trump's issue stances. Before Trump even announced for president, OnTheIssues had hundreds of excerpts from Trump's books and statements during his previous presidential flirtations. After Trump announced for president, OnTheIssues readily found dozens more excerpts, and we will find dozens more every month because we LOOK for them. Trump wrote a policy book in preparation for the 2012 presidential race, and Trump also has an older policy book which he wrote in preparation for the 2000 presidential race. Those are serious policy books, and serious reporters might read them and stop whining that Trump has no policy positions -- because those books are full of them! In summary, anyone who reports on daily candidate attacks, or about hairstyles, should NOT be called "serious reporters." Those articles should be relegated to the Entertainment sections. The mainstream media should be ashamed of their coverage of Trump, and should get off their lazy butts and read his policy books and then report about them. The authors of the articles cited above -- who all claim to be "serious reporters" at "serious journalistic institutions" -- should apologize to the public, or should resign from journalism, or both. Trump is not the problem with the political system -- the news media's REPORTING about Trump IS the problem! Donald Trump: We prospered after 9/11; we'll prosper after Great Recession. Donald Trump: 2006: Warned about impending implosion of financial sector. Donald Trump: Being a know-it-all shuts the door on new ideas. Donald Trump: Business is an acquired skill based on discipline & focus. Donald Trump: Pragmatic positive: be positive, but be realistic. Donald Trump: Americans don't know their roots: study your ancestry. Donald Trump: Comprehensive education instead of limiting subjects. Donald Trump: Oil is the lifeblood of all economies. Donald Trump: Partner with environmentalists when undertaking projects. Donald Trump: Things change; empires come and go. Donald Trump: 1988: Flew sick kids cross-country on his private jet. Donald Trump: Business students should read Sun Tzu's "The Art of War". Donald Trump: Greatest fear? I don't have any; I only have "concerns". Donald Trump: I believe in the toot-your-own-horn theory. Donald Trump: I'm more humble than people might think. Donald Trump: Build your reputation as "responsible, professional & loyal". George W. Bush: OpEd: Bush's presidency made tough situation for 2008 GOP. Donald Trump: Took chance by starting Clear Channel radio program. Ayn Rand: Wealth is the product of man's capacity to think.